Her dad was hoping for a Halloween baby, but instead, Marianna Harutunian’s parents got a hurricane baby, a newborn who arrived smack in the middle of superstorm Sandy. The 7-pound, 5-ounce girl made her debut at 8:38 p.m. Monday, one of a slew of reported births that took place amid the howling winds and rising floodwaters of the historic weather system that plowed through the East Coast. Marianna was among 18 babies born at North Shore University Hospital in Manhasset, N.Y., not unusual for a Monday. In fact, all 12 hospitals with maternity programs in the North Shore-LIJ Health System were busy with babies during the storm, according to spokesman Terry Lynam. "It would certainly be accurate to say 'dozens,'" Lynam said. 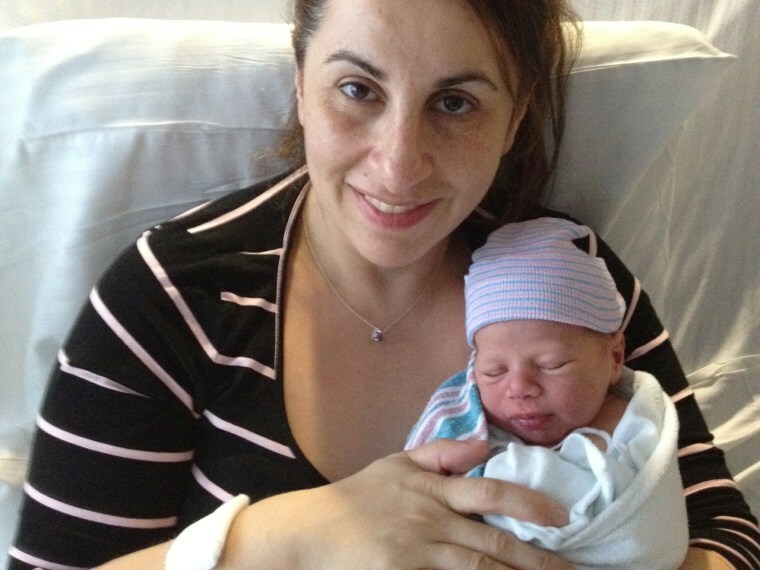 The timing was a surprise for the baby's dad, Vartan Harutunian, 44, of Glen Oaks, N.Y. The baby was already five days late so Harutunian, a detective, and his wife, Marina, 40, a lawyer, imagined she might arrive on Halloween. The hospital is only a couple miles from the family's home, but downed trees and fierce winds made the trip an ordeal. “Whew, it was a little bit of a roller-coaster ride,” said Harutunian. The couple also have a son, Joseph, 2. Marianna was one of three babies delivered during the storm by Dr. Jessica Jacob, an obstetrician in private practice. The hurricane wasn’t as bad as a blizzard, but “it’s still very scary,” observed Jacob. The storm logged a near-record low barometric pressure Monday afternoon, bottoming at 27.76 inches according to the website Accuweather.com. Still, neither science nor most obstetricians, including Jacob, put much stock in theories that the sudden drop in pressure sends women into labor. Still, there were babies. Julia Almany was having contractions at NYU's Langone Medical Center when the power went out. The Almanys couldn't see the storm, but the sounds came through loud and clear. "I heard this crazy rushing of water sound," Doron told TODAY's Andrea Canning. As Julia labored, the basement and ground floor of the hospital flooded. Julia's contractions became more intense, so her husband Doron helped doctors give her an epidural —in the dark. "I was holding a cell phone above her while they were putting in the IV and while they were putting in the epidural," he said. They transported Julia down the stairs and into an ambulance uptown to Mount Sinai hospital. En route, they heard a loud sound, and found out that a tree branch had fallen on the ambulance roof, but they made it safe, and just in time to meet baby Micah. "As soon as he was born," Julia said, "you just forget." In Hillsborough, N.J., storm baby Liam Alexander Schleppy arrived at 11 p.m. on Monday in a medical shelter trailer erected by Hackensack University Medical Center. When Christine Schleppy, 34, went into labor five weeks early Monday, her husband, David Schleppy, 38, called 911. Downed trees and closed roads prevented them from making it to two local hospitals, so the couple went to the emergency mobile unit, located inside a church gym. Christine, who noted to Savannah Guthrie that she received no epidural, gave birth to Liam, a healthy, 5-pound, 2-ounce baby boy. "We're both doing great," she told Guthrie on Wednesday. "He's amazing. For five weeks premature, he's perfect.